Paris & Brussels : big brother, little brother ? Brussels (Bruxelles in French, Brussel in Dutch, Brüssel in German; pop. 140,000 for Brussels City, 1 million for Brussels-Capital Region) is the capital of Belgium and of the European Union and the seat of numerous international organizations, such as NATO. It is a multicultural and multilingual city where there is always something happening, be it one of the many festivals or a political summit. Divided in 19 municipalities, Brussels often feels like an aggregate of towns with distinct personalities. It was a patchwork of styles well before it became cosmopolitan, from the sumptuous Renaissance façades of the Grand Place to the scattered Art Nouveau houses and the grand classical monuments. Brussels is the third richest and most influential city in Europe, and one of the best places to wine and dine. Brussels is a global city. The World City Survey ranked it as the fifth most influential city in the world in 2010. The American journal Foreign Policy ranked Brussels third in Europe in its Global Cities Index, right after after London and Paris (and 11th worldwide). Understand Brussels' complex multi-lingual make-up, its administrative divisions, main thoroughfares and transport hubs. Brussels through the ages, from the capital of the Duchy of Brabant to the governing city of the Habsburgian Netherlands, to the capital of independent Belgium and the European Union. Find out about the most popular attractions, Brussels' highest towers, as well as attractions in the outskirts. Discover the world's greatest market square, its magnificient Gothic town hall, the classical architecture in the downtown area, and the world-famous peeing boy, Manneken Pis. Shop for antiques at the Grand Sablon, stroll around the Fine Arts Museum, and explore the elegant classical administrative Upper Town, with its monumental Supreme Court, the sumptuous Royal Palace, and the elegant Belgian Parliament. Visit the European Parliament, a stupendous piece of postmodern arhitecture, and have a look at the seats of the European Commission and Council. Gape at Europe's widest triumphal arch in the Jubilee park, visit its world-class museums, and admire the unusual Palais Stocklet, a World Heritage Site. From Mini-Europe at the foot of the iconic Atomium to the Japanese pagoda and Chinese pavilion, Laeken is full of surprises. Incidentally, the nearby Basilica of Koekelberg is the world's third biggest church after St Peter of Rome and St Paul in London. Did you know that Brussels had over 100 museums and dozens of annual festivals ? Find out about the most interesting ones. Know your way around Brussels' nightlife scene, its cinemas, theatre, the opera, and other venues for spectacles or jazz concerts. Find sports and fitness clubs near your home, and enjoy Brussels' dozens of great parks and gardens. It's not always easy to find what you are looking for in a big, decentralised city. Be it for shopping centres, hypermarkets, food markets, flea markets, or just to find speciality tea shops, souvenirs, or a good English-language bookshop, you will find it all here. With over a dozen Michelin-starred restaurants and cuisine from all over the world, the European capital is one of the best cities on the continent to wine and dine. Avoid the tourist traps and find the good tables here. Need to find a doctor or a hospital ? Looking for a post office or a police station ? Or do you just need publications on living in Brussels ? Check this section. Compare travel time by air, train or coach from surrounding countries, and organise your trips around Belgium and Brussels. 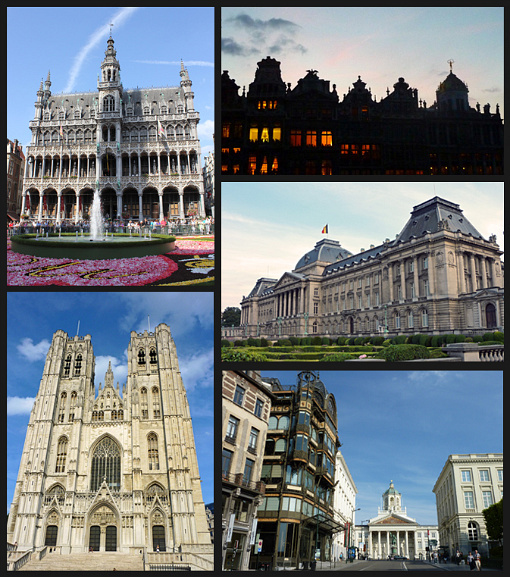 There are plenty of hotels in Brussels, especially in the mid-range and top-end section. The array of luxury hotel is quite amazing for for a city of this size. Click here for a list of 5-star hotels in Brussels, with location and links to their websites. For a more general listing, please consults our directory of lodging in Brussels. If you are in Brussels for more than a week but no longer than a few months, staying at hotels quickly becomes hard on the wallet, and renting a regular apartment is close to impossible (most owners won't let for less than 6 months). The solution is to stay at a short-term furnished apartment, which is half-way between a hotel and long-term apartment, as much for the price as the size. You will have more space than at a hotel, have a kitchen and feel more like at home. It is also an excellent place to stay when you arrive and start looking for long-term accommodation, as the whole process usually takes a few weeks. Try the hospitable and cozy Villa Primavera (short-term rentals in central Brussels), which has two locations - one on each side of the European district. In the budget range, Sleep Well Youth Hostel is probably the cheapest one can find in town, as long as you don't mind spartan rooms or bunk beds.